November is National Diabetes Month and Nov. 14 is World Diabetes Day. Why devote the month and that day to diabetes awareness? 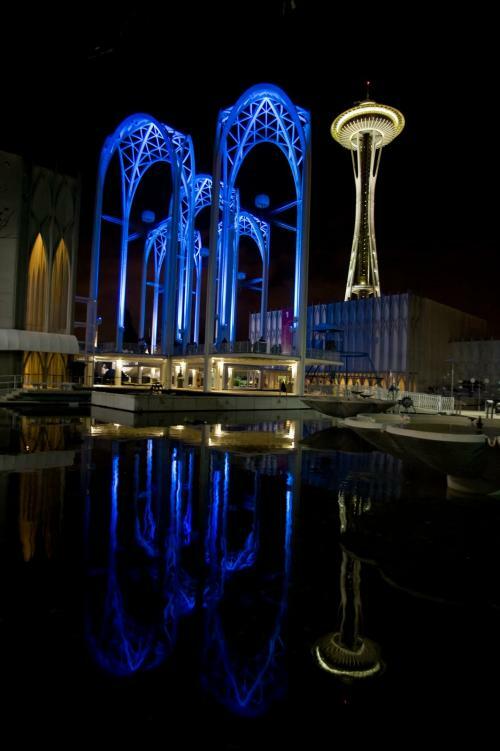 Reflections on World Diabetes Day — The Pacific Science Center Arches turned blue for World Diabetes Day in 2011. Here’s a great reason: The risk of diabetes might run in your family. Don’t think of it as just something your grandparent or your neighbor’s friend has; think of it as something that could affect you in your lifetime. Think about what is important to your health. What are you willing and able to do? Decide what your goals are. What changes do you want to make? Choose one goal to work on first. Decide what steps will help you reach your goal. Pick one step to try this week. Simple action steps could include making healthier food choices and being active at least 30 minutes, five days per week. Losing 5 percent to 7 percent of your body weight can greatly improve your overall health and decrease your risk for diabetes. On the evening of November 14, Benaroya Research Institute at Virginia Mason will be one of 12 buildings and monuments in the Puget Sound area that will light blue to shine light on Seattle’s unique diabetes research collaboration and dedication to outstanding clinical care. Learn more at benaroyaresearch.org/wdd.